CHESTERTOWN — Local furniture maker Frank Rhodes has accomplished a personal trifecta. First, he has built a work that is being shown in New York’s Whitney Museum of American Art. Second, that work is an exact replica of a piece from his grandparents’ estate collection. And third, the original is very likely the work of John Townsend, who is a bit of a god in the furniture-making world. So how did this perfect trinity come about? To begin, a little history: Rhodes is the grandson of Col. Edgar William and Bernice Chrysler Garbisch. The couple are famed for their collection of “naive” (primitive) paintings and fine furniture, known as the Garbisch Collection. Much of their collection was housed in their estate in Cambridge. (They also had homes in New York and Florida.) After their deaths, both in 1979, the majority of the paintings were given to museums. Other pieces were sold or auctioned off to private collectors. Their Cambridge estate, Pokety Farm, is where Rhodes discovered his love for furniture and antiques when visiting there in the summers as a child. Not long after his grandparents’ death, he began recreating many of the furniture pieces from the Garbisch Collection, as well as building his own original works. Because of his renown as a furniture maker, and his close ties to the Garbisch Collection, Rhodes was contacted by a group of artists out of New York, known as Triple Canopy, who publish a magazine of the same name. Triple Canopy had chosen the Garbisch Collection as the focus of their exhibit in the 2014 Whitney Biennial. According to the artists’ statement accompanying the exhibit, their installation, titled Pointing Machines, is meant to be a commentary on how the meaning of artworks shift as they are commissioned, made, collected, disowned, replicated, photographed, exhibited and published. It focuses primarily on paintings from the Garbisch Collection, and reproductions and transparencies of those paintings. It also prominently features a mahogany washbasin stand from the collection. Although it is unknown what happened to the Garbisches’ stand after it was sold during a Pokety Farm estate sale in 1980, there are two known versions – one at the Metropolitan Museum of Art in New York and one at Winterthur in Delaware. Russo said his group chose the stand because of “its anachronistic quality, as an outmoded technology” — what they jokingly refer to as pre-Internet plumbing. Front to back: the original washbasin stand, Frank’s recreation and a plastic polymer version. Rhodes played a major part in the Triple Canopy installation by meticulously recreating the Colonial-era stand in his Chestertown workshop on Morgnec Road. The original from the Met is included in the exhibit, as is a third version in 3-D printed plastic polymer. Rhodes was thrilled to play his part in Triple Canopy’s plan. “It’s really cool how it transpired from my grandparents’ collection and I’m able to make something they owned,” he said. The exhibit also includes one of Rhodes’ photos taken at Pokety Farm, with his grandparents’ stand visible in the corner. Rhodes started his version of the washbasin stand in January, with just seven weeks to complete it. He began by doing extensive drawings of the original at the Met, then moved to his workshop, where Lori Elborn-Brown and Doris Reedt assisted him. Rhodes estimates it took 200 to 300 hours to complete the finished product. There was an added bonus to the excitement surrounding the project. The original, circa 1765-90, is believed to have been the work of John Townsend. Anyone involved in furniture making or antiques will likely be familiar with the name. According to the Metropolitan Museum of Art website, Townsend is one of the greatest of all 18th-century American craftsmen. Rhodes would agree. “His work is at the top in the collecting world,” Rhodes said. 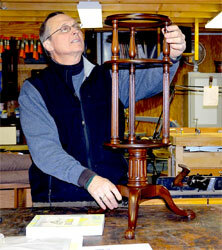 Recreating a Townsend piece was both a pleasure and an honor for the furniture maker. 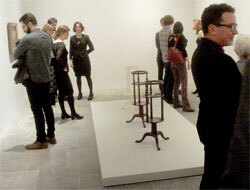 Rhodes also was honored to be a guest at the first opening of the exhibition in New York on March 4. Upon seeing his washbasin stand and the installation in its entirety, he said he couldn’t have been more pleased. “The whole show was very well organized … the lighting was excellent, and everybody was really interested in the work.” The exhibit opened to the general public March 7 and will run through May 25.